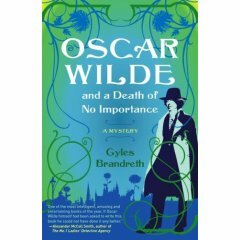 Oscar Wilde and a Death of No Importance by Gyles Brandreth. Touchstone, 2007. This is my first novel for the 2010 Ireland Reading Challenge. Narrated by Robert Sherard, Oscar Wilde and a Death of No Importance is the first of a planned nine book series of mysteries featuring the witty writer as an amateur sleuth. The novel begins in 1889 with Oscar introducing Sherard to his new friend Arthur Conan Doyle, whose A Study in Scarlet is causing a sensation. When Oscar Wilde finds the naked body of his sixteen-year-old friend Billy Wood, an artist’s model, he is inspired by the fictional Sherlock Holmes to take on the case himself. Yet before he can investigate the murder, he must prove that there has been one. When Oscar returns to the crime scene the next day he finds that the body has been removed and the room cleaned, with a single spot of blood the only sign that any foul play has occurred. Not prepared to leave the case solely in the hands of Scotland Yard, Oscar uses deductive reasoning and observation to investigate the case himself. Robert Sherard, an aspiring poet and journalist in the middle of a messy divorce, serves as the Watson to Oscar Wilde’s Holmes. Oscar Wilde and a Death of No Importance offers not one historical figure but three. Surprisingly, Wilde and Conan Doyle did actually know one another. Both were invited for dinner by an American literary publication called Lippincott’s Magazine, which was searching for talent. The dinner resulted in commissions for both men; a further Sherlock Holmes story from Conan Doyle (The Sign of Four), and a novel from Wilde (The Picture of Dorian Gray). In his autobiography Memories and Adventures Conan Doyle wrote that he and Wilde became friendly although it was a distant relationship that grew more distant as Wilde’s reputation became questionable. Narrator Robert Sherard is also a historical figure. As noted in the novel, he was the great grandson of the poet William Wordsworth and a loyal friend of Oscar’s. He wrote some of the earliest biographies of Wilde, including The Story of an Unhappy Friendship (1902), The Life of Oscar Wilde (1906), and The Real Oscar Wilde (1917). As a historical biographer of Wilde he is the obvious choice for a Watson who can record his friend’s cases. Part of what makes this story so enjoyable is the author’s use of Wilde’s trademark wit. In a Q&A at the back of the novel Brandreth explains that Oscar did actually try out lines on his friends and if he liked them would go on to use them in his works. Some remarks are instantly recognisable as lines Wilde actually used, such as “work is the curse of the drinking classes.” Brandreth also works in details such as the death of Oscar’s sister Isola in childhood and his tradition of dressing in mourning on his birthdays. In explanation Oscar once said, “this happens to be my birthday, and I am mourning, as I shall henceforth do on each of my anniversaries, the flight of one year into nothingness, the growing blight upon my summer.” Although Wilde was from an Anglo-Irish Protestant family, he had a life-long interest in Catholicism which culminated in a deathbed conversion. This interest is shown in the novel through his knowledge of hagiology. I approached this novel hesitantly because the task of crafting original dialogue for one of the wittiest men who ever lived seemed nearly impossible to complete. How could any author hope to capture this extraordinary author and turn him into a sleuth? Rarely have I been so glad to be proven wrong. Brandreth so effectively shapes dialogue for Wilde that the reader can’t tell what lines the dramatist actually said and which have been invented for him. Wilde’s friendship with Conan Doyle and admiration for the deductive detective give him the perfect motivation to take on the role of sleuth and the flawed but loyal Sherard is an effective narrator. I must confess that while I love mysteries, I don’t have the mind either to write or solve them. As a child reading the “Clue” series I often flipped straight to the answer instead of trying to solve the case, but in Oscar Wilde and a Death of No Importance even I could figure out some of the answers. Plot isn’t the number one reason to read this book though, that slot belongs to the charming and engaging Oscar Wilde. I thoroughly enjoyed his Holmesian deductive style and his easy wit. Overall this is a fun romp through Victorian England that promises to be the beginning of a great series. There are two others currently published of a planned nine novels and I look forward to diving into the next mystery (which features Dracula novelist Bram Stoker and the introduction of Lord Alfred Douglas) and to spending more time with Brandreth’s Oscar Wilde. Verdict: The title is a groaner but Oscar Wilde and a Death of No Importance is absolutely worth reading. Sounds like a good start to a fun series! Great review – I’ll add it to the challenge page. Interesting review. I saw this book listed in the Globe some time ago and it sounded interesting enough that I put in a request for it at the Milton library, but it never came in before I moved. I was quite worried about how well the author might handle it without being … silly. Sounds interesting.